Lucja – EHFC Members Talking! 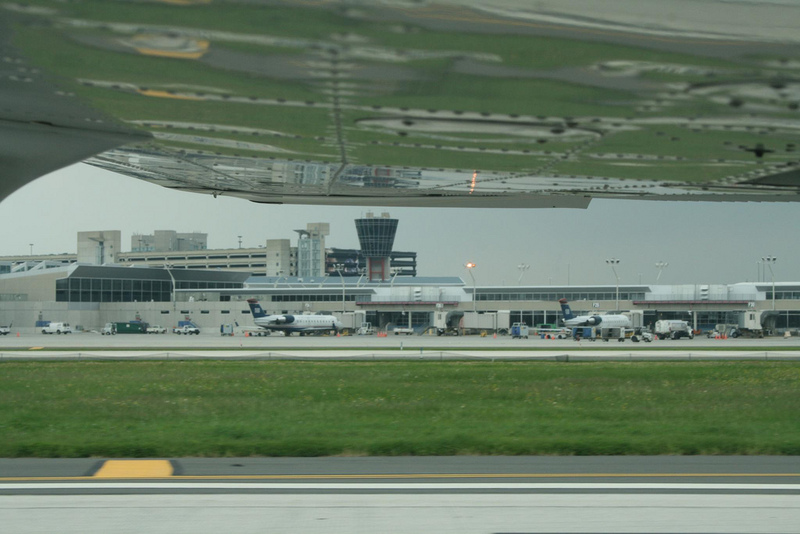 This is the story of my recent trip to Philadelphia, landing at the Philadelphia International Airport (KPHL). It was my first trip to a Class B airport, although I had been in Bravo airspace before in New York City. 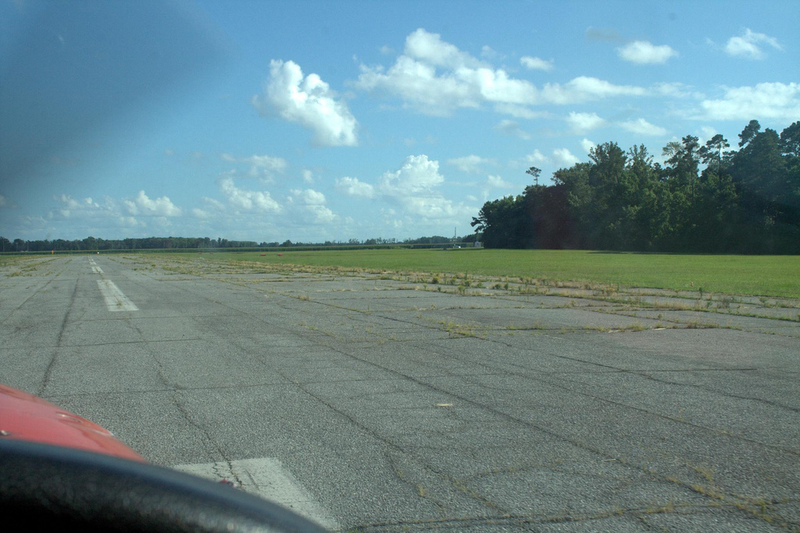 I was concerned about the feasibility of flying a small Cessna into a Bravo airport, but this turned out to be very easy to do, at least at KPHL. So, I thought a writeup would be useful and interesting to anyone who might be curious about Bravo operations. As usual, there are more photos from the trip on my Flickr site. The goal for this trip was to fly from Ithaca to Philadelphia, spend one or two nights there and then return. I used to live in Philadelphia from 2001-2003 and hadn’t been back for a while, so it was an obvious fun destination for a flight. I was initially planning to fly into Northeast Philadelphia (KPNE), but then while looking at the sectional my eyes were drawn to the big airport south of the city. I asked myself whether I was crazy to even think about this, but it didn’t seem that insane. 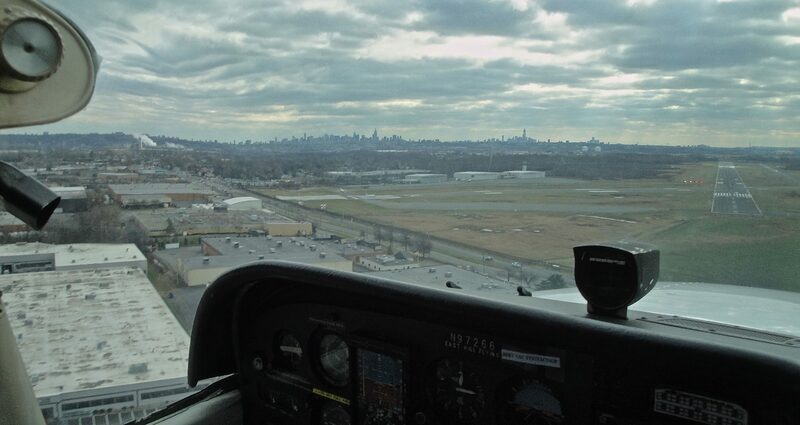 I had flown in the NYC Bravo before, VFR and IFR, and I had been very near the Boston Bravo as well with no trouble. So, could it be feasible to actually land at a Bravo airport, at least at the right time of day? Upon asking a few more experienced friends, I learned that KPHL is a fairly welcoming airport for general aviation aircraft. In particular, they are set up with separate runways for big commercial planes and for general aviation aircraft, which simplifies operations a lot. From Airnav.com, I found out that fuel prices and landing fees were very reasonable, certainly cheaper than some airports I had already been to (e.g. Hanscom). My idea was starting to sound a lot less crazy. A few days before my planned departure, I called the Philadelphia ATC facility on the phone, at the business phone number listed in the Airport/Facilities Directory Supplemental. I asked them if it was ok to fly a 172 into KPHL, as well as the best time of day to do it. The person I spoke to was very nice and told me that their “slow time” was 10:45 am to noon, if I wanted to aim for that. Things were starting to look better and better. I still made sure I was very familiar with both KPHL and KPNE in case a divert to the latter became necessary, but I was pretty confident I would make it to KPHL. 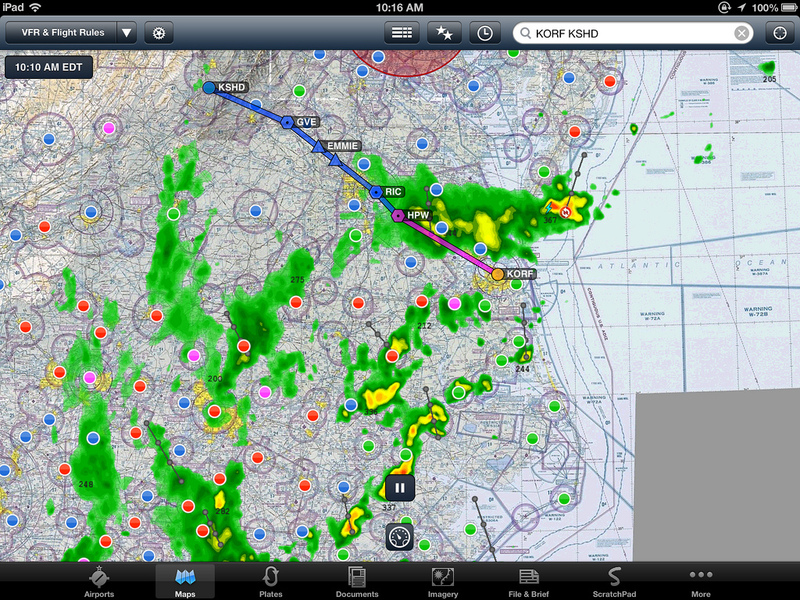 For the trip down to KPHL, I filed IFR with one of the suggested routes in Foreflight: CFB LVZ ETX PTW, which takes you over Binghamton, Wilkes-Barre, just outside of Allentown, Pottstown and into Philly. 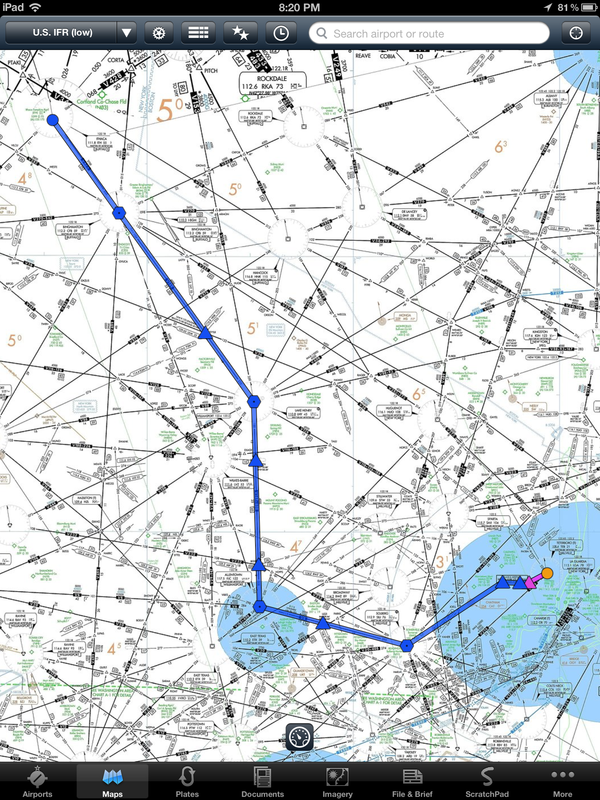 I flew that exact route, at 7000 feet and with no in-flight rerouting (for an explanation of IFR flying and routing, see my earlier blog post). The weather was pretty good VFR and forecast to stay that way, but I wanted to file IFR as I thought it would make it easier getting into Philly. At big/busy airports, it can be easier to get in IFR because they are “expecting” you, whereas a random VFR arrival may be annoying and require them to change things around. Conversely, it is often easier to get out of a busy airport VFR, as IFR clearances can be hard/slow to obtain at busy times. So anyway, here I was, happily flying in good weather, with no clouds to be seen anywhere. Somewhere around Allentown, I tuned in to the KPHL ATIS – they have a separate ATIS for arrivals and departures there, which I had never seen before but it works as expected. I had been monitoring Philly weather on the Stratus while in-flight, so I was pretty surprised when the ATIS announced the ceiling as 1800 broken. The weather had been much better than that previously, although there had been marginal VFR conditions at nearby airports so I was not totally taken aback. Still, it was clear that I would not get a nice view of the city on the way in, and that I would have to shoot an instrument approach. 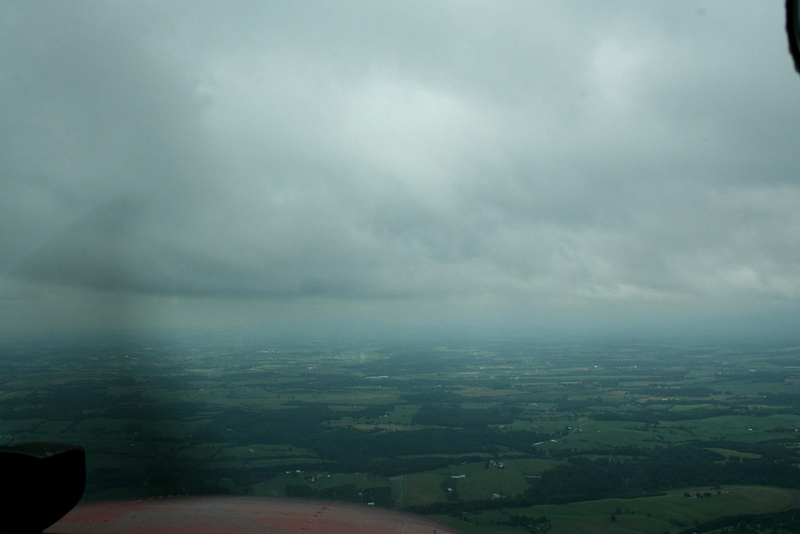 Allentown Approach descended me to 4000 feet, and shortly after Pottstown we entered clouds. 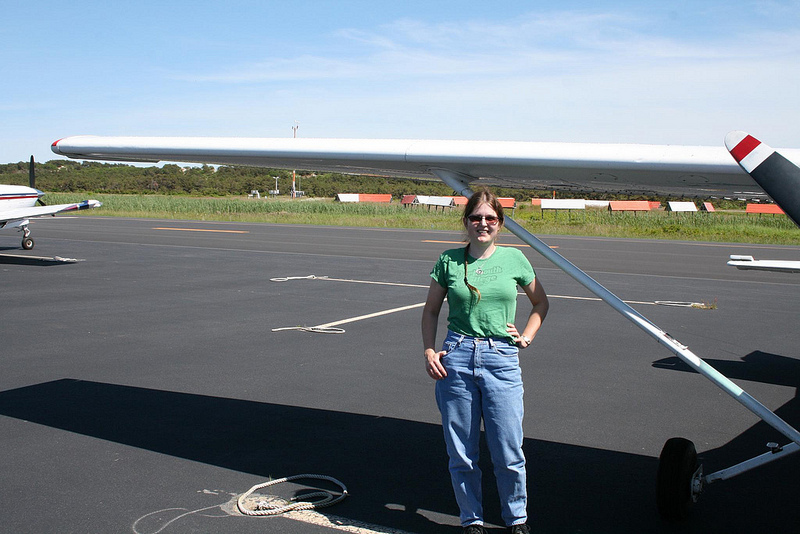 After my Providence trip blog post, I received a lot of positive feedback about my explanations of IFR procedures. I thought I would continue here and give a more detailed description of the approach I flew into Philadelphia. For the knowledgeable readers, it was a very routine Converging ILS 17, and you can skip to the next section :-). An instrument approach procedure is a step-by-step recipe for descending and landing at an airport when you are in the clouds. There are different kinds of approaches based on different navigational technologies. 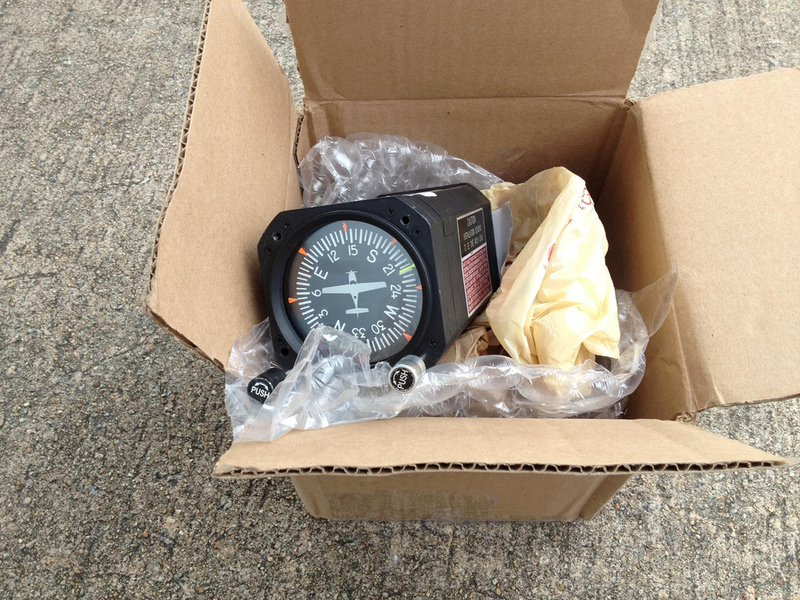 One common technology is the ILS, or instrument landing system. You fly an ILS approach by tracking two radio signals. One is called the localizer and provides you left/right guidance; the other is called the glideslope and provides vertical guidance (telling you to descend faster or slower). If you have ever driven past the Ithaca airport on Warren Rd and seen the orange installation at the 14 end of the runway, that’s the localizer antenna for our ILS. If you fly and follow both the localizer and glideslope signals accurately, they will take you down to the runway. However, you cannot actually fly on instruments all the way to the ground: approaches have “minimums”, i.e. an altitude beyond which you can only descend if you can see the runway visually. 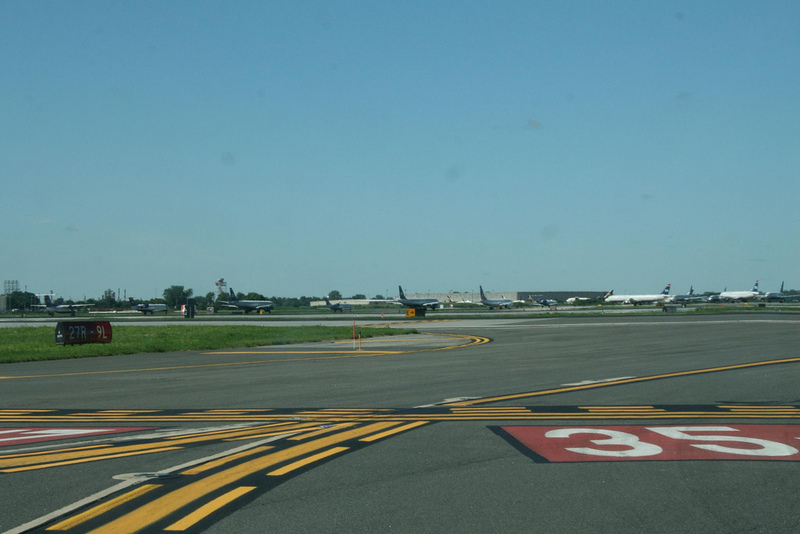 If you get to the minimums and do not see the runway, you must “go missed” – go around and follow the “missed approach procedure”, which is a sequence of steps designed to take you up safely to a place where you can attempt the approach again or go somewhere else. 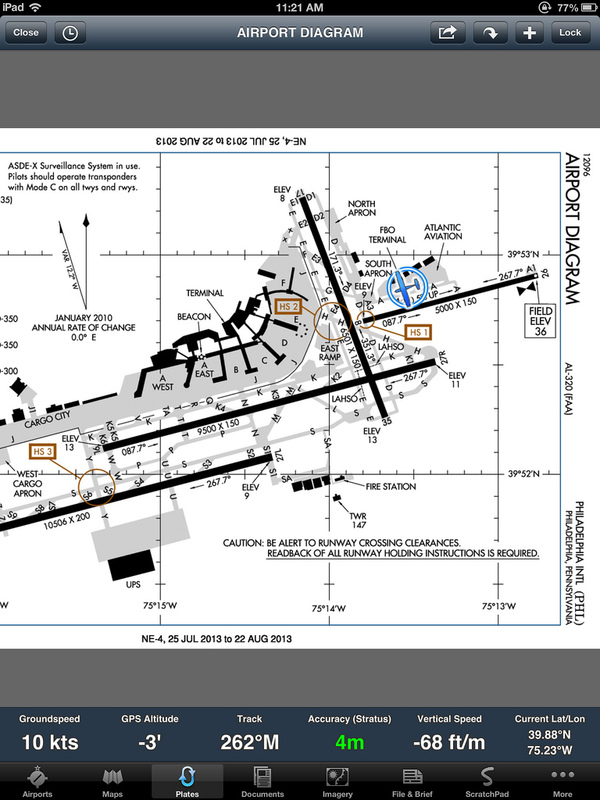 Every approach is described in a diagram called an “approach plate”; here is one for the Ithaca ILS to runway 32. 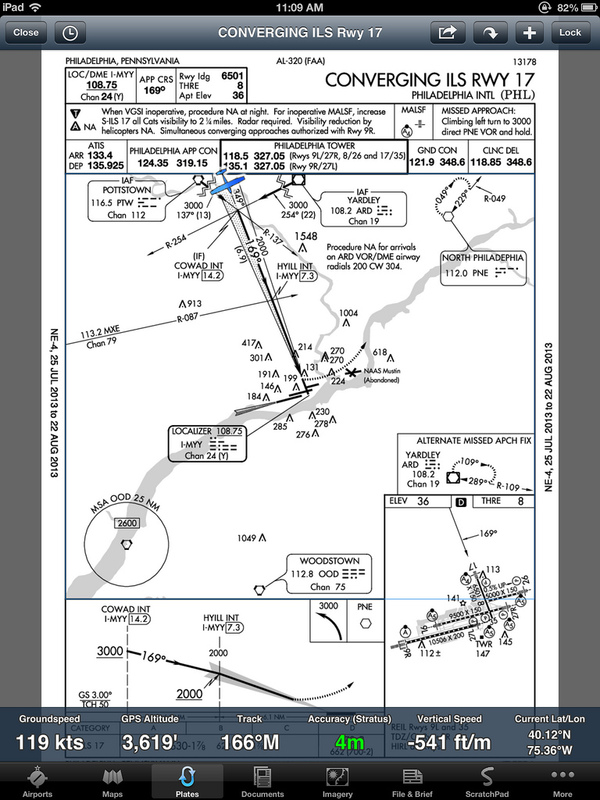 An approach plate has useful information like relevant frequencies (at the top), a big stylized map of the procedure (the triangle/arrow symbol in the middle represents the localizer, and you can see the Ithaca airport at the tip of the arrow), a “side view” of your descent (bottom right) showing altitudes, a small diagram of the airport, and the approach minimums (in this case, 1349 feet). When you fly an approach, you have this plate in front of you on your iPad or on paper, and refer back to it to make sure you haven’t forgotten anything. 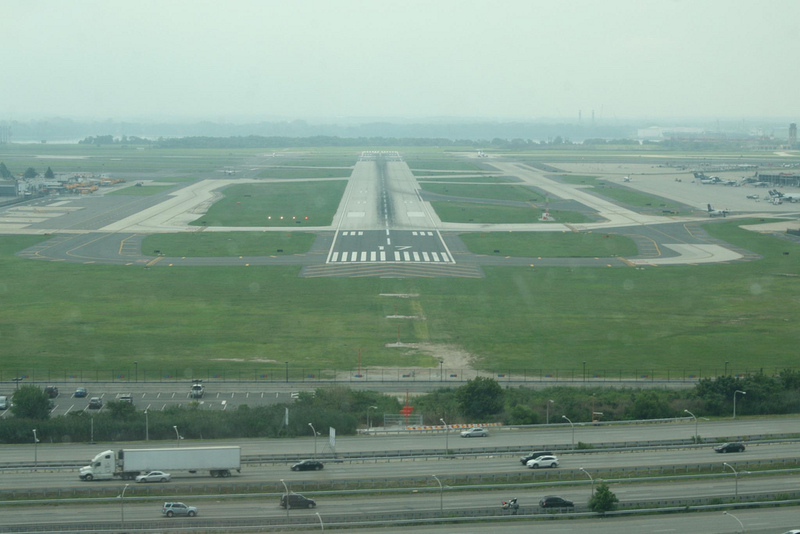 When I arrived in Philadelphia, I flew an ILS approach to runway 17. 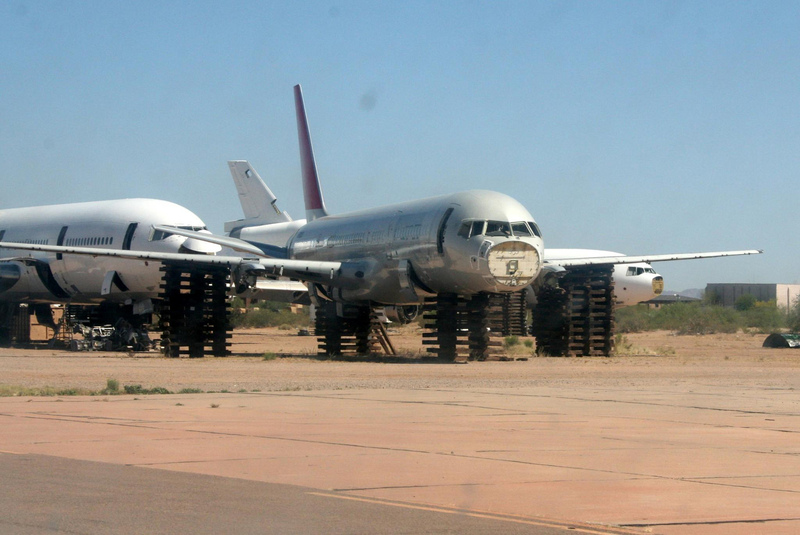 There was also another approach in use – ILS to 9R, which is what the commercial planes were landing. Therefore, I had to use a special approach plate for the Converging ILS 17. You can see the plate in the accompanying image, and Foreflight has a handy feature where it shows you the position of your plane on the approach. You can see me on the localizer and descending. We broke out of the clouds a bit lower than 1800, maybe more like 1600. At this point I still couldn’t see the runway, because the visibility was not good due to haze. 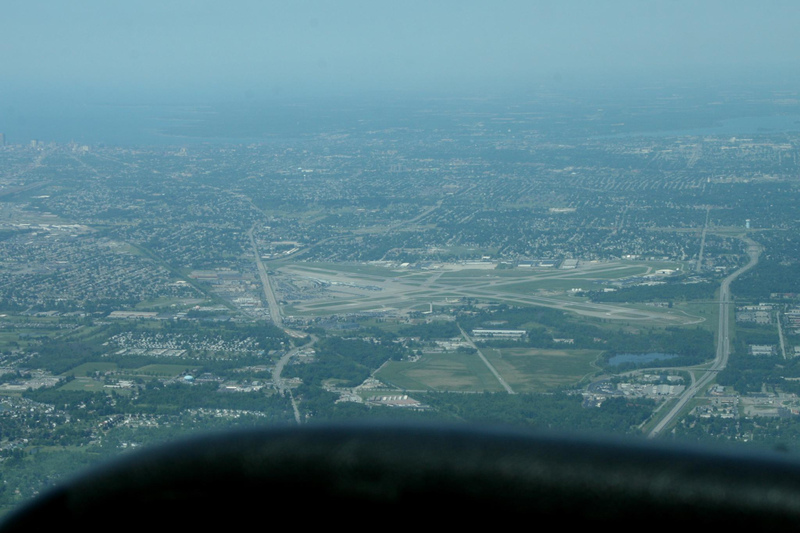 However, I was well above minimums, so it was safe to continue on the approach. 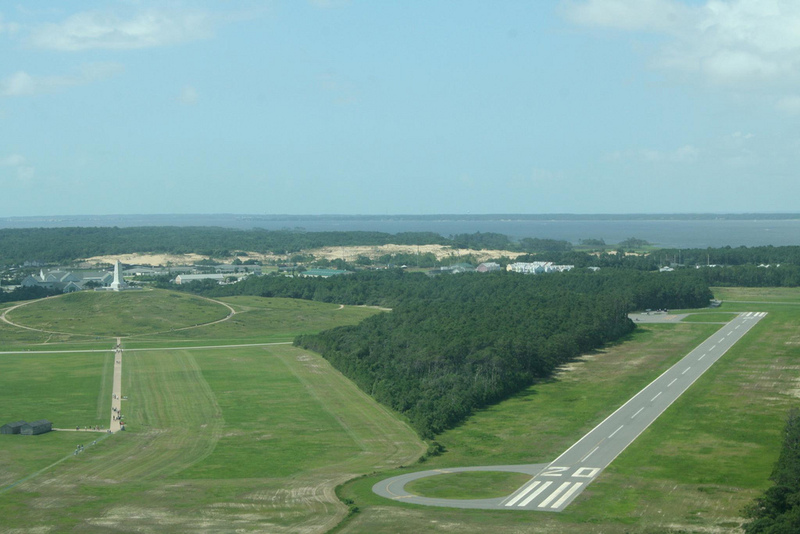 A few hundred feet lower, I caught sight of the runway and continued the approach visually. During this whole time, there were aircraft departing across my runway, on 9L (9R was being used for arrivals). The tower controller cleared me to land but let me know there would be “numerous departures ahead of me”. There was one aircraft on the ILS 17 before me, but no-one else behind me – it was now about 11am and definitely the slow time on the airport. Once I landed, Tower instructed me to taxi to Atlantic Aviation via Golf, Delta and Alpha (and to stay on Tower frequency – it really wasn’t busy!). I had been warned that taxiing is often the most confusing part of navigating a big airport, so I had studied the airport diagram extensively before. I knew that the two runways used by general aviation planes were 17-35 and 8-26, and that I would be aiming for the northeast corner of the airport. I also left the Stratus device on so that it would provide me GPS information on where my plane was on the runway. However, my worries turned out to be unnecessary as the next thing I heard from Tower was “actually, just follow the Gulfstream to Atlantic”. A Gulfstream had emerged from somewhere – possibly that was the plane on the ILS 17 before me, or possibly not – and was taxiing north on Delta, turning towards the FBO. It was easy enough to follow him, so that’s what I did, and soon I was parked and chocked at the FBO. While taxiing, off to my right, I saw the passenger terminals, including the F terminal where the commercial flights from Ithaca arrive. 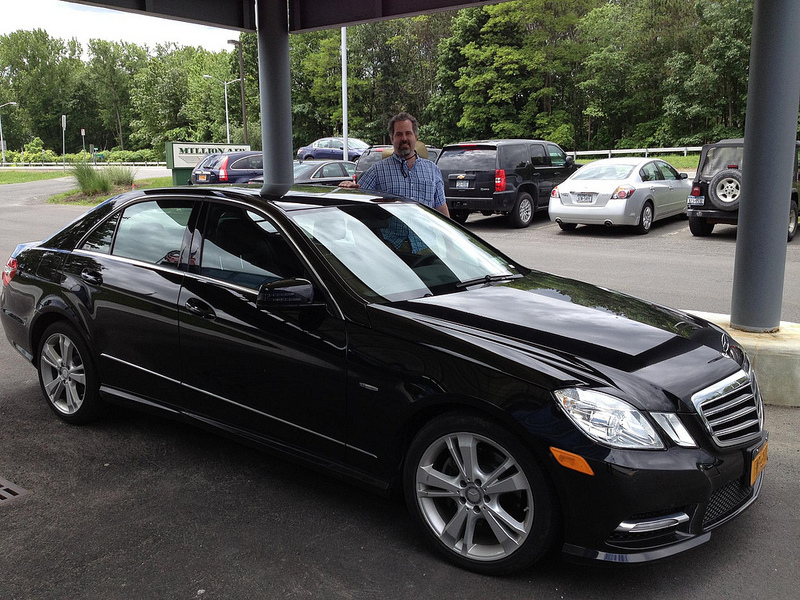 At the FBO, the staff was extremely friendly and helpful and gave us a van ride to the Eastwick train station, where we caught a train into the city. That is definitely a nice thing about Class B airports – they are often served by public transit and you can get around easily and cheaply once you land. We spent a day in Philadelphia, and then we were ready for the trip back. For the trip back home, we were planning to leave around 11am, again shooting for the slow time. The weather was looking very good in Philadelphia, as a cold front had passed the night before. Ithaca, though, was reporting broken 1200 or so, with forecast improvement. I thought it would be prudent to file IFR. When I called the briefer, he informed me that a number of runways at KPHL were going to close later that morning, including 17-35. I decided to depart earlier than 11 to get out before the closure; the wind was moderately strong out of the north and I figured a takeoff on 35 would be easier than on 26, but mostly I was thinking that with all the runway closures I would end up with a more confusing taxi and a longer wait on the ground. Therefore, I filed for a 10:30 departure. Getting out proved relatively easy. 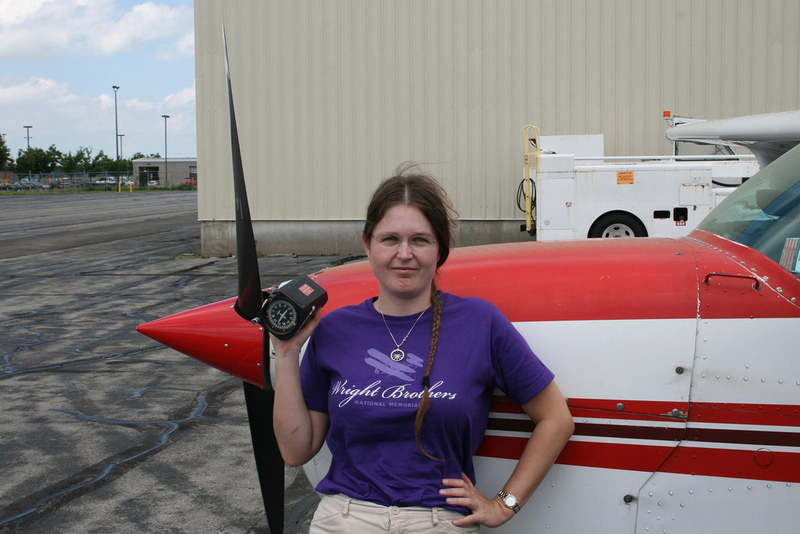 All the controllers I talked to – Clearance, Ground and Tower – were very helpful and in fact spoke significantly slower to me than they did to the other aircraft. I had heard about this from other people who had flown into Philly – the controllers there really do take “extra care” with small planes. Of course I could have handled their instructions even spoken at a normal pace, but I wasn’t insulted because receiving “extra care” is honestly not a bad thing, and definitely preferable to getting yelled at. Interestingly, clearance assigned me an altitude of 7000 feet, which is the wrong altitude for a westbound flight, but I just told myself “well, IFR routing in the Northeast is mysterious, if that’s where they want me that’s where I’ll fly”. Taxiing out was a bit more complex than taxiing in, but still not too hard. I made sure to turn my transponder to “ALT” on the ground, as mentioned on the airport diagram, so that Ground could keep track of where I was on the airport. (I learned to do that in Providence, which has the same requirement; there I didn’t do it the first time but PVD Ground politely explained I needed to do it.) Philly Ground had me taxi on Alpha, then via Delta to runway 35 at Kilo for an intersection departure. 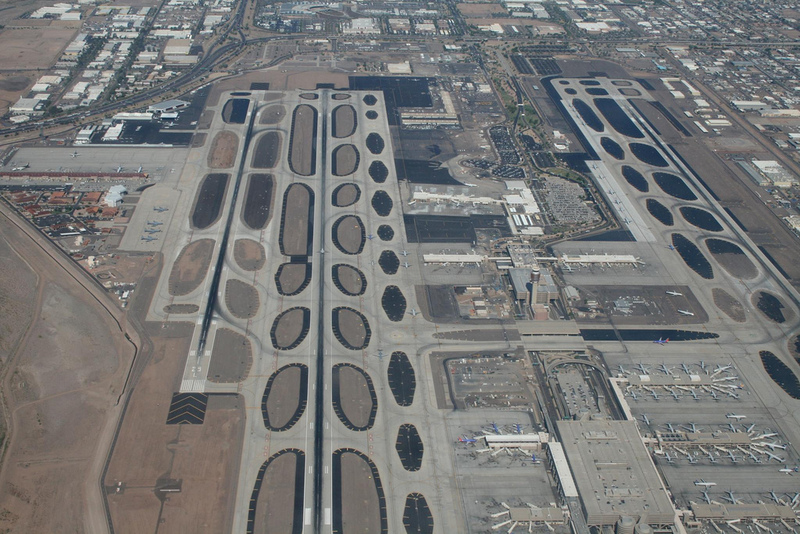 All runways were in use, with departures on runways 26 and 27L, and landings on 27R. My intersection departure would mean that I would not interfere with the landings on 27R, though I still had to hold short for other traffic on 35. It was an impressive sight to see – all four runways in use at the same time, and everything was going smoothly and in an orderly fashion. 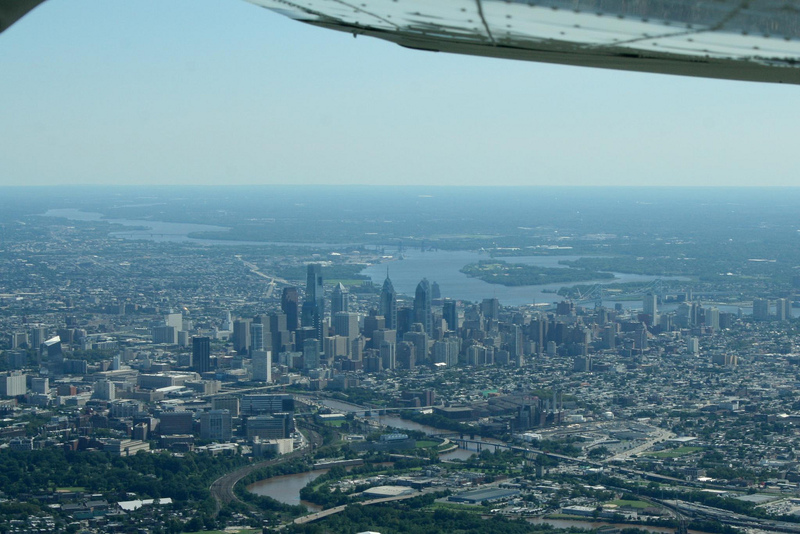 We took off at about 10:30 and had a great view of downtown Philadelphia to our right. I had to stay relatively low (3000 ft, then 4000) for a long time; it wasn’t until Allentown that I was allowed to climb to 7000. 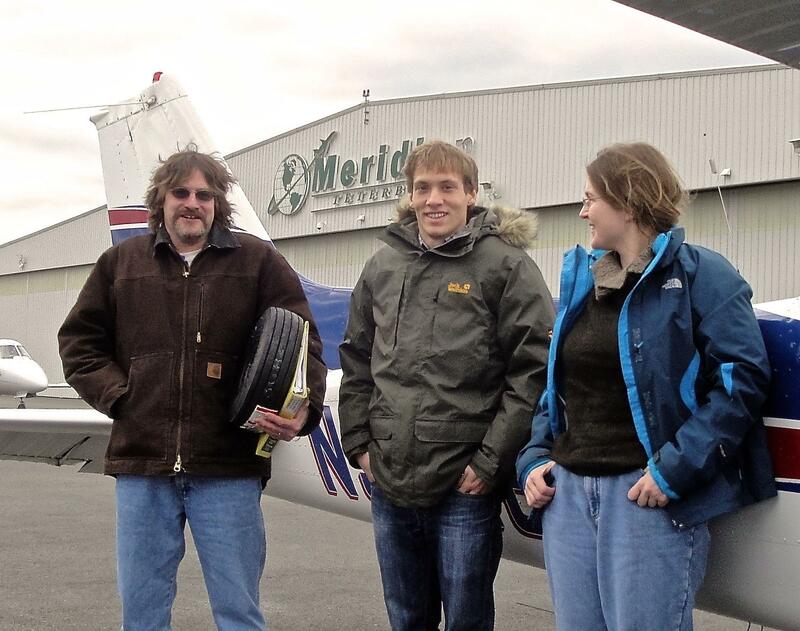 This was much the same as my arrival, in reverse – back then Allentown had dropped me to 4000 feet relatively early. I assume the airspace above me was needed for something else, which was fine by me. 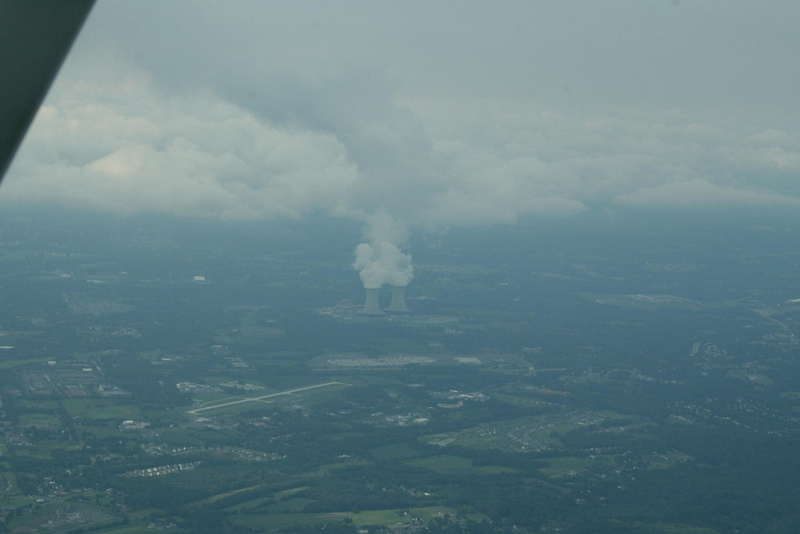 Somewhere around Allentown, the clouds appeared, and we flew just above an overcast for a long time. After the passage of the cold front the previous night, it was quite cold at that altitude, maybe 5 degrees Celsius to be generous, and I was mindful that I should be watching for ice when we re-entered cloud. 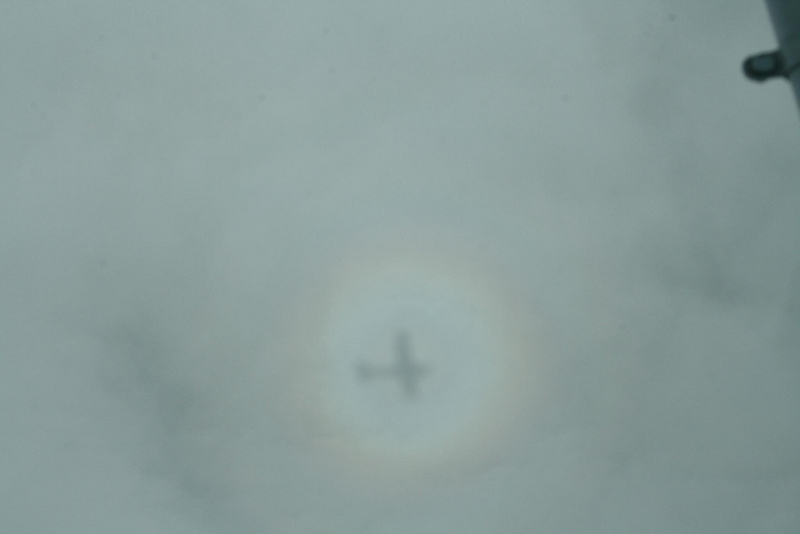 Somewhere between Allentown and Wilkes-Barre, we saw a Dash-8 heading in the opposite direction at 8000 feet – why he was so low and why he was also on a “wrong-way” altitude I do not know, but hey, that’s IFR in the Northeast for you. Just after the handoff from Wilkes-Barre to Binghamton I was descended to 6000ft, where it was much warmer but we were now in the clouds. We remained in the clouds almost until the end, a good 45 minutes or more, with only very occasional moments in the clear. I heard a number of aircraft picking up pop-up IFR clearances from Binghamton Approach (that’s when you take off VFR but decide it’s unsafe to continue – sometimes you can convert to IFR en route if ATC is not too busy). A helicopter was getting a Special VFR into Binghamton as well; clearly the weather was worse than what some people had anticipated. As for me, I was safely IFR already, and I shot the ILS 32 approach into Ithaca, where the ceiling was 2100 broken, although I broke out higher than 2100 AGL so it really wasn’t that bad. The winds were pretty gusty all the way down final to provide a bit of “excitement” for the last part of the trip, and then we were back home. This was a great trip and I would definitely recommend PHL airport to anyone. 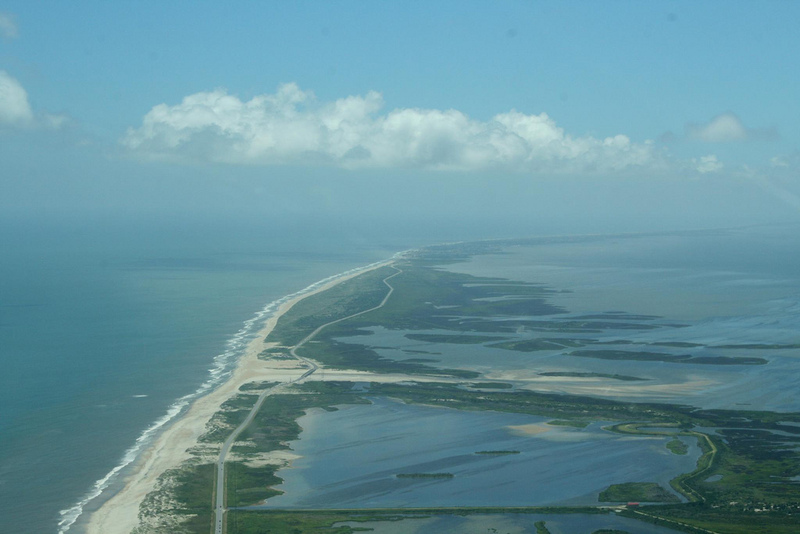 It is a great place to fly into and a great first Bravo airport. 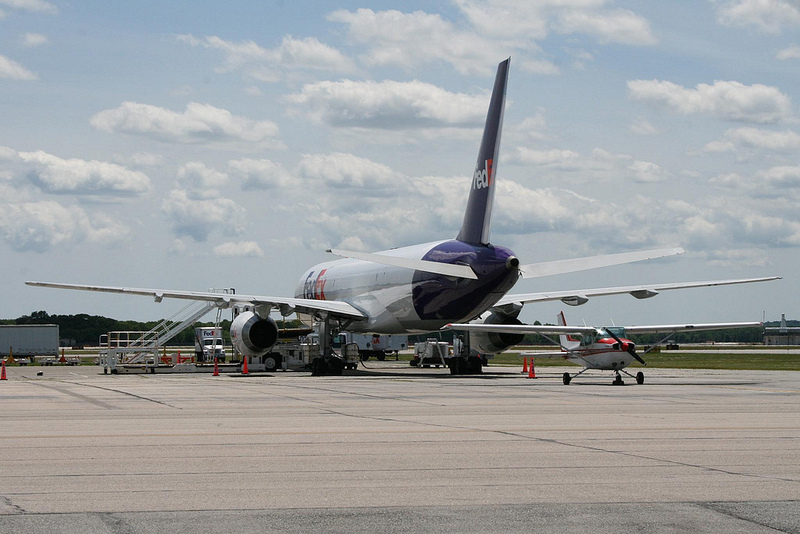 It also provides advantages that some smaller airports don’t, such as accessibility to public transit. I used to think of Bravo airports as no-go zones, but after this trip my outlook has changed. I realize that many Bravo airports are not as friendly to small planes as Philly, but now when planning trips to any destination and choosing where to land I will definitely not dismiss Bravo airports out of hand. The other thing I would highly recommend is an instrument rating. As should be obvious from all my posts this summer, it greatly broadens your horizons and gives you the ability to fly trips much more reliably and safely, thereby greatly increasing the amount of fun you can have! This past Friday, I flew N53045 to Niagara Falls. It was a fun and easy trip, and the views were amazing (more photos on my Flickr page). 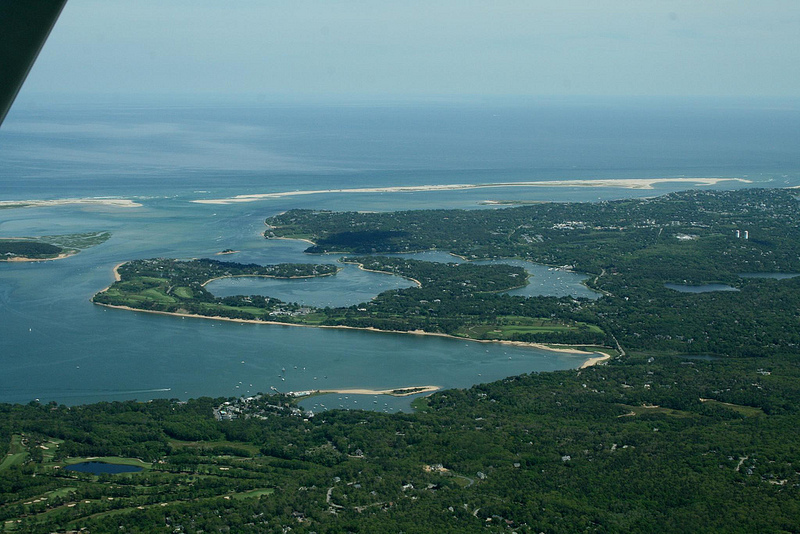 I know that many EHFC members have already made that trip, but I thought I would post a detailed description of my experience for the benefit of those who haven’t and are thinking about going there sometime. So, what follows is the “For Dummies” description of how to do the trip, or at least of how I did it. When I was planning the trip, I was a little concerned that it might involve complications due to the unique procedure for flying the Falls and the proximity of the Canadian border. However, as I said, it turned out to be very easy. 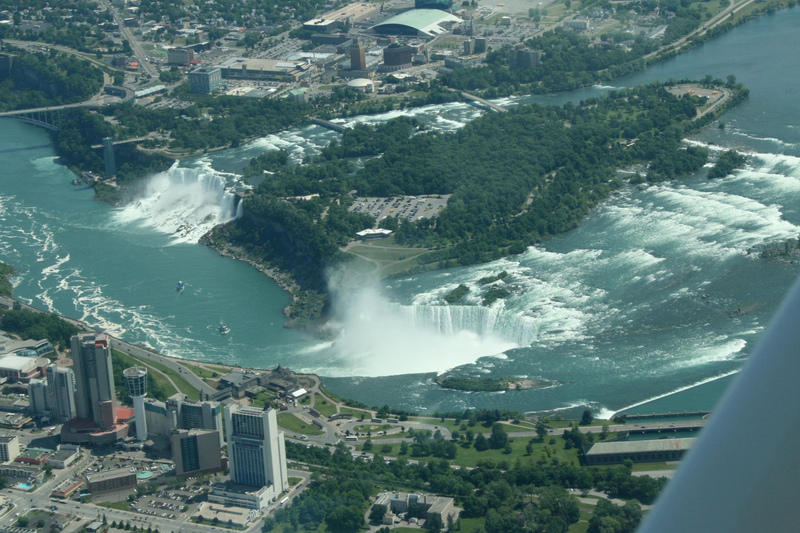 Basically, there is a special procedure in place for touring Niagara Falls from the air. 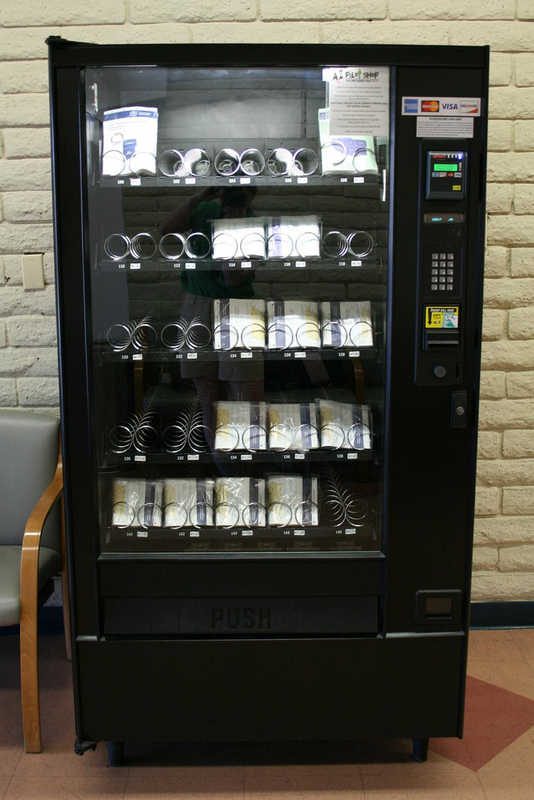 You can find the details in the Airport/Facility Directory, currently pages 370/371. Reading these pages reveals that you are allowed to overfly the falls at or above 3500ft, in a clockwise pattern that technically takes you into Canada for a little while. There is a CTAF for the pattern so you can announce your position. The other important thing to note on the diagram is the restricted area on the US side where you may not descend below 3500 ft; more on that later. I read the A/FD instructions in depth and I also looked at a satellite view of the area on Google Maps. This was very helpful in giving me an idea of the landmarks to watch for; in fact, the pattern drawn in the A/FD is not quite proportioned right. What you fly is much closer to a circle than the elongated racetrack shape they give. There is also a river/canal on the Canadian side to the south and west of the pattern, providing a natural boundary. Yes, all of this turned out to be overplanning as the pattern is very easy to fly, but I still wanted to highlight Google Maps as a valuable resource for planning VFR trips with unique navigational procedures. Otherwise, I planned the flight as I would any other cross-country, with IAG as the destination. I decided to go on a weekday figuring there would be less traffic over the falls. On the day of the flight itself, I got a weather briefing and everything looked good. So, we got in the plane and off we went. In Ithaca, I requested flight following “to Niagara Falls”, figuring I would save the description of my full intentions for Buffalo Approach. The flight was fun and uneventful. We climbed to 6500 feet, for a better view and to stay out of the way of any local traffic. The views were pretty; we saw a good number of the Finger Lakes, Geneseo and their grass runway, and eventually (despite our 20+ knot headwind!) arrived in the vicinity of Buffalo. On the radio, I was first talking to Elmira, then Rochester, and finally Buffalo Approach. When I got handed off to Buffalo Approach, I descended to 4500 feet and described my intentions (tour the falls, then land at IAG). The controller was helpful; also, there was hardly anyone else on the frequency so he had lots of time to talk with me. He double-checked that I was familiar with the procedure for touring the “Scenic Falls” – that seems to be the term the locals use, which makes sense since too many things are called “Niagara Falls” in the area. I got vectored around a little bit to keep me out of the way of BUF arrivals, but soon I was allowed to descend to 3500ft and proceed direct to the Scenic Falls. 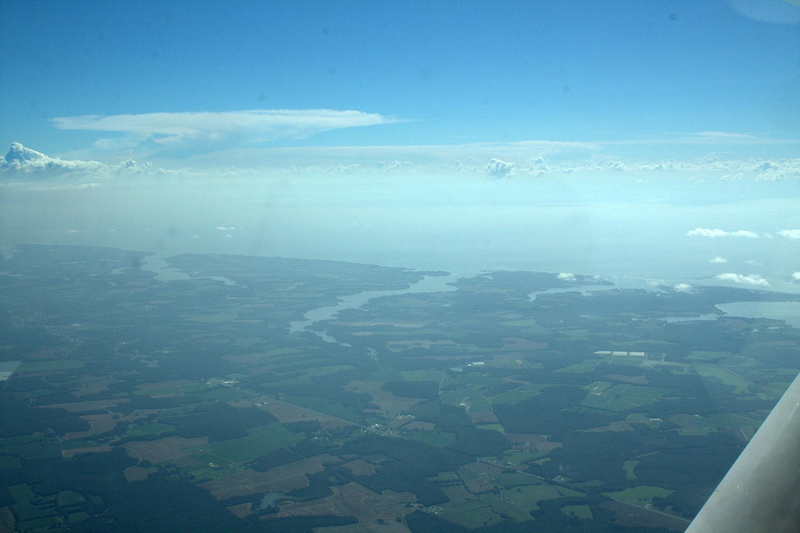 I flew west along the river at that point; the falls were soon in sight – there is a very obvious point on the horizon where the river “ends” and there is a white plume rising into the air :). The Buffalo Approach controller instructed me to switch to the CTAF (122.05) but keep my squawk code, and to contact Niagara Tower when done with the falls tour. (More radio terminology: IAG is referred to as just “Niagara”, as in “Niagara Tower”, “Niagara Ground”, etc.). And then we were over the falls! 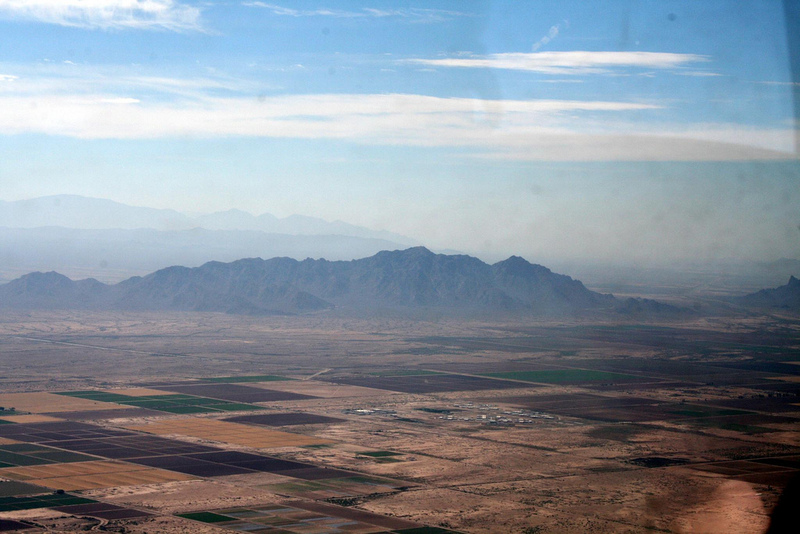 On the CTAF, I announced my position and altitude before entering the pattern. I heard two other voices on the frequency, these were the pilots of helicopters doing the “official” tours below 3500ft. I saw one of these helicopters, well below me and “hanging out” near the Horseshoe Falls. I wasn’t too sure what CTAF calls to make so I just called twice per “orbit” – once at the railroad yard turning north, and once at the Rainbow Bridge turning south. There was no-one else in the pattern at my altitude. 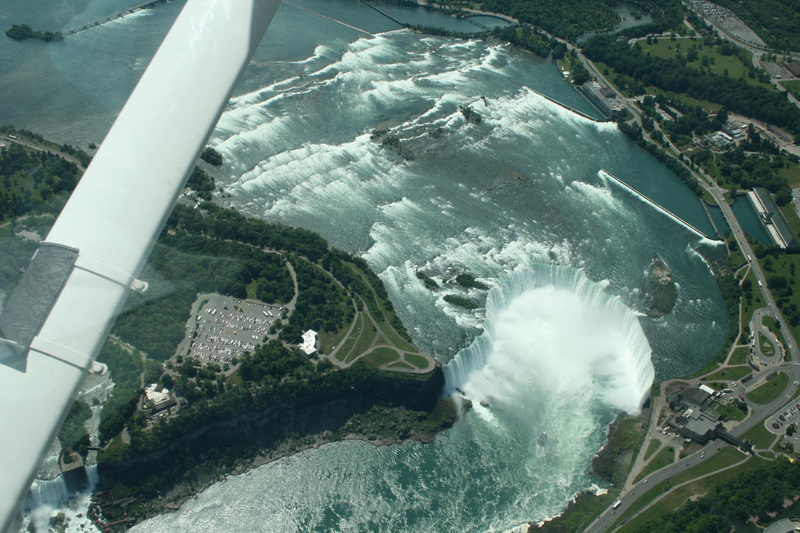 I flew the pattern three times, once to get oriented and twice more to admire the falls. What can I say; as you see from the photos, the sights are incredible. Walker got a much better view than I did, of course, sitting on the right side. It was amazing to be able to fly almost directly over the falls and see the rainbow effects from the sunlight on the mist. When we had had enough, I switched to the Niagara Tower frequency and called inbound. They advised me to enter a right downwind for 24, but reminded me to remain above 3500 ft until clear of the restricted area. This was the part which I had not properly anticipated; basically, to land at IAG coming from the falls, you need to lose 3000 feet of altitude very quickly — and in my case, even quicker due to a strong west wind. I realized it would be tricky and requested “a left 360 or similar maneuver to lose altitude”. Niagara Tower advised me to extend my downwind as necessary instead. I did that and landed successfully on 24. At IAG, I was a bit concerned about the taxiing; if you look at the diagram, they have multiple taxiways permanently closed, as well as some additional runway and taxiway closures and name changes announced by NOTAM. Fortunately it wasn’t hard, since landing on 24 I was able to turn off directly to the FBO on taxiway H.
At that point, it was just about noon so we went for lunch at a diner in the vicinity — Salisa’s All American Diner, maybe 10 minutes’ walking distance. The food was good, and I would definitely eat there again. We came back to the FBO, where they had fueled our plane in the meantime at my request, and we were ready to go back to Ithaca. Niagara Ground assigned me a somewhat unexpected runway for departure given the wind conditions (possibly to save taxi-related time and confusion?) but it wasn’t unsafe and I had no trouble dealing with the takeoff. The trip back was also simple; this time, we had to do it at 3500 feet due to increasing cumulus clouds with bases somewhere in the 4000’s. We had a tailwind now, so before we knew it we were back in Ithaca. On the trip, I logged 2.1 hours going there (headwind + falls tour) and 1.2 hours coming back. Again, it was easy, completely trouble-free and a very worthwhile experience. It made me realize how lucky we are to have such a scenic attraction within easy day-trip distance from Ithaca. I would recommend this to anyone looking for a fun cross-country trip, whether with family/friends or even alone.